So for our 2nd day in Hong Kong, our plan is to go Disneyland and spend the whole day there. I know everyone dream to visit Disneyland; I tell you honestly that during my elementary days and until now, I really wan to stay and have a vacation in Disneyland. I want to see Mickey and Minnie Mouse in person, I want to hug and have some picture taking with them and I believe that at Disneyland, the atmosphere of "where dream come true". Well, I'm correct! because in Disneyland, I really feel that I'm a princess. We woke up early, have our breakfast at the room and prepare for the things we need for our Disneyland adventure.We take MTR Tung Chung Line to Sunny Bay MTR Station then interchange to Disney Resort Line to Disneyland. The feeling of enchantment begins inside the train which are painted in colorful with classic photos illustrating classic characters like Mickey, Minnie Mouse and rest of the group. I also like the window and rail handle with a shape of Mickey Mouse. Of course, we took lots of pictures inside the train. Before we enter into main entrance, we had our never ending photo ops within the area. Of course, our visit at Disneyland will not be complete without meeting and greet my favorite Disney characters, Mickey and Minnie Mouse and take some photos with them, so after 30 minutes of waiting finally we meet them in person. Yippee! We roamed around the park, enjoying the place since the weather is doing fine. The park features the most popular rides and adventures. It also compose of Adventure Land, Main Street U.S.A, Fantasy Land and Tomorrow Land. We amuse walking at the Main Street and enjoying the view of the surroundings. The first thing we do is take our lunch at Starliner Diners located at Tomorrow Land. It offers burgers, fried chicken, fries, salads and sundaes. We spent HK$128.00 for the 2 of us. After lunch, we decided to explore the Fantasy Land. We watched Golden Mickey which takes about 30 minutes. It is a musical celebration of Disney films and characters. We also try the many adventure of Winnie the Pooh and take our journey in the happiest cruise that ever sailed, the "it's a small world" featuring colorful dolls from different regions of the world, your favorite Disney characters, elaborated set and memorable music. We walked through the magical portal into a timeless realm of enchantment at Sleeping Beauty castle. We didn't try to ride at Cinderella Carousel because of huge number of people on the line, so we opted to have picture taking instead. We also took pictures at Mad Hatter Tea cups but sad to say didn't ride it since Ian refuses to try it. We also explore the Tomorrow Land where we try the famous Space Mountain. It is a thrilling high-speed journey to the far reached of the universe and back on this interstellar coaster. We make it a point to have some picture taking at "It's a small world" ark. We also enjoy the Stitch Encounter where you can talk and play with mischievous experiment 626 or much known as Stitch at the space traffic control center. We had a chance to watch Mickey's Philhar Magic where you can watch the adventure of Mickey Mouse in 3D. We also try the Buzz Light-year Astro Blaster which you ride along in a space cruiser to help Buzz Light-year save the universe. In this ride, we provided a laser cannons to fire at all kinds of aliens and spaceships. We travel around the park until we reached the Adventure Land where we watched the Festival of Lion King. We witness the colorful pageant of music and dance at the same time inspired by and celebrating Disney's animated classic "The Lion King". We didn't get a chance to experience the Rafts to Tarzan's Tree House, Tarzan's Tree House and Jungle River Cruise since they suspended it due to bad weather, so we decided to take lots of pictures. Sad to say that around 8pm, the management declared to cancel the fireworks display at 9pm due to bad weather. So we have no choice but to leave Disneyland and have our dinner near the Hostel. We had an enjoyable day at Disneyland. It was really an experience to remember, I swear! 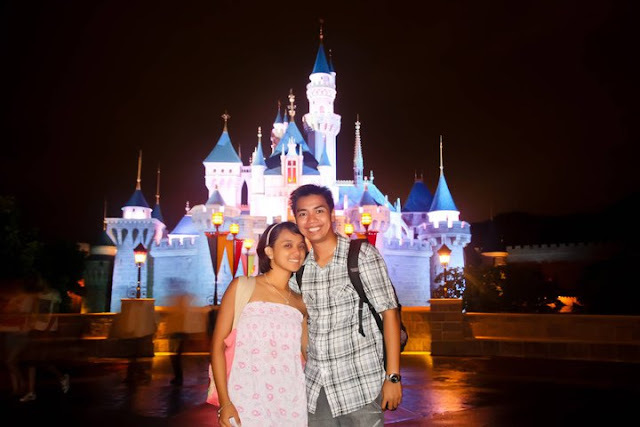 Our Disneyland adventure will always bring happy memories for both of us.